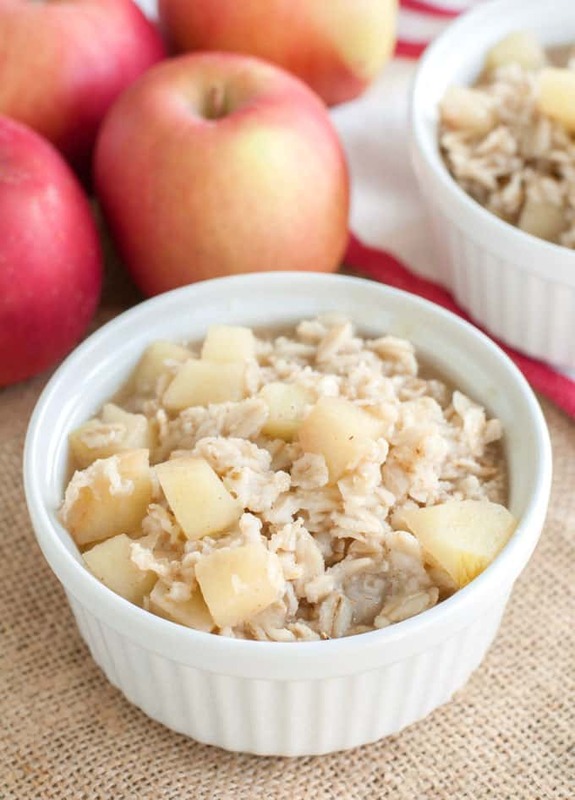 Apple cinnamon oatmeal is a warm, delicious way to start your morning. Packed with fresh apples and spices. Thank you Maty’s Healthy Products for sponsoring this post. When it’s cold outside my kids want something warm to eat before school. A big, tasty bowl of oatmeal always does the trick. It’s cozy comfort food that does a good job of filling up their bellies. 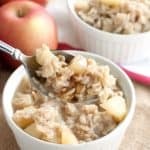 This apple cinnamon oatmeal is one of their favorites especially in the fall and winter months. The colder months also seem to bring the sore throats and coughing. We can’t seem to escape the scratchy throats and constant coughing. 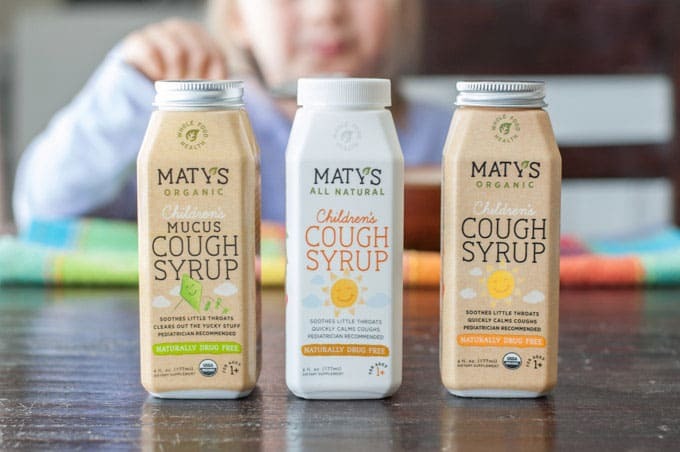 That is why I like to have Maty’s All Natural and Organic Children’s Cough Syrup on hand. It helps to soothe their dry, irritated throats using all natural and certified organic ingredients. 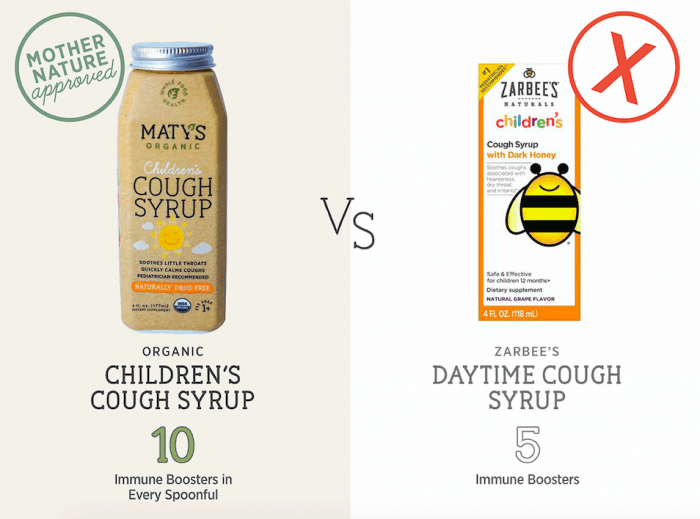 I love that Maty’s All Natural Children’s Cough Syrup has 10 immune boosters in every spoonful, not to mention there are no scary ingredients. 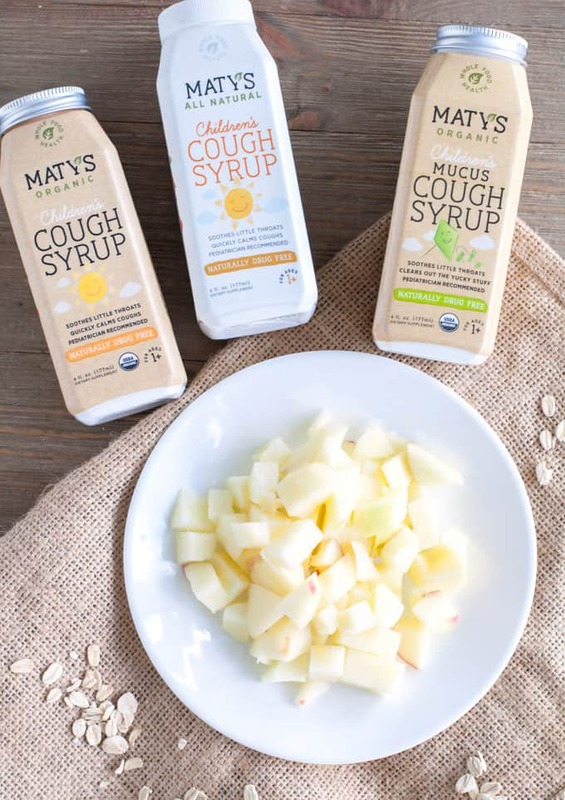 Since the cough syrups are made with whole-food ingredients, Maty’s All Natural Children’s Cough Syrup can be used to replace honey or maple syrup for an extra immune boost. How cool is that?! I like to drizzle a little of the cough syrup on top of the oatmeal. 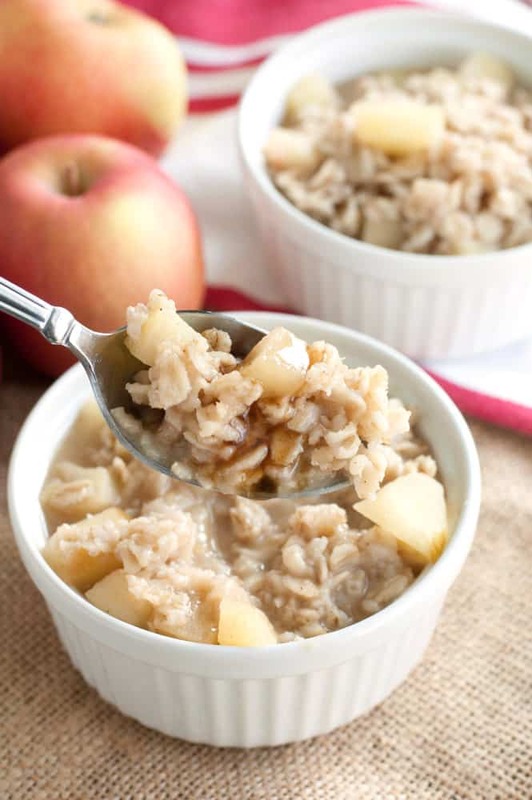 To make this apple cinnamon oatmeal, start by sauteing diced apples with cinnamon and butter. I recommend using a crisp, sweet apple like Honeycrisp, Gala, or Fuji. Cook the apples long enough for them to slightly soften, about 5 minutes. Next, add in brown sugar and water. Bring to a boil and then pour in oats. Give the oats a good stir and then cover the saucepan and remove from heat. Let sit for 15 minutes to cook the oats. Once ready to serve, I like to splash in a little half and half or milk for a little extra creaminess. This step is totally optional. 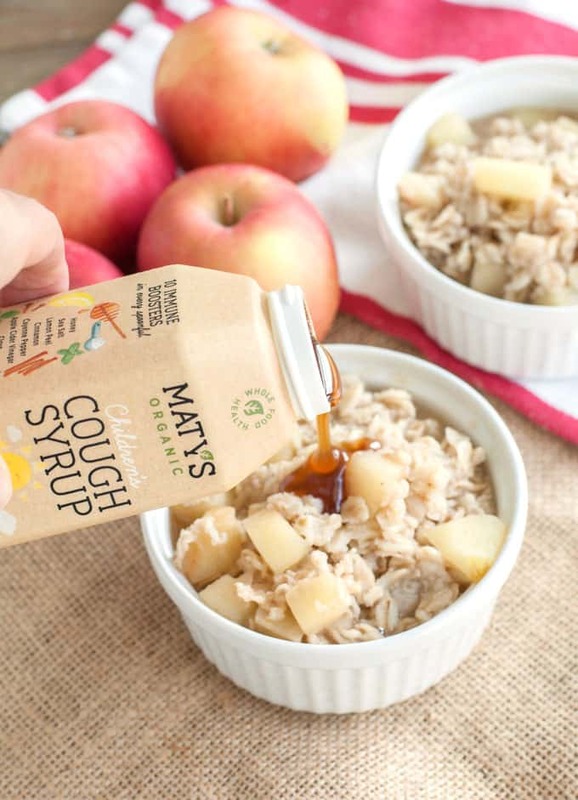 I then drizzle the top of the oatmeal with about a teaspoon of Maty’s All Natural Children’s Cough Syrup for that extra immune boost. Make sure you shake the syrups well! You can find Maty’s products at a variety of stores. Don’t forget to see how Maty’s Healthy Products compares to over the counter products with this Maty’s All Natural comparison chart. 1/2 tsp cinnamon You can also use apple pie spice. Melt butter in a medium saucepan. Add diced apples and cinnamon. Stir over medium heat until apples are soft. Add brown sugar and water. Bring to a boil. Add oats and stir to coat. Remove saucepan from heat and cover. Let it sit for 15 minutes. Follow Maty’s on social media for more information on their all natural products.